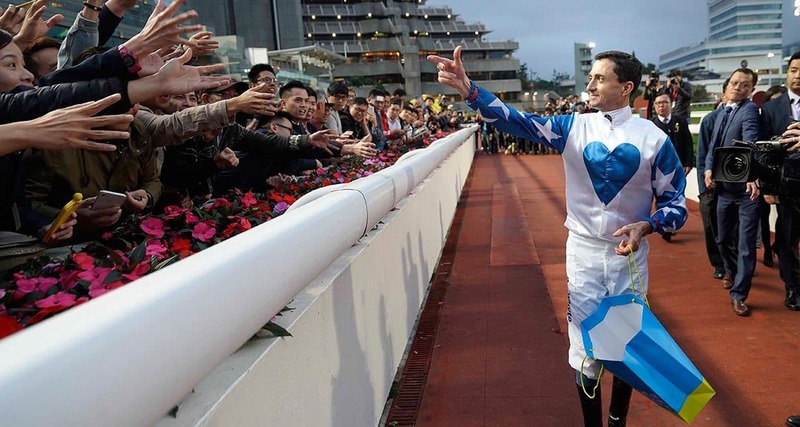 Douglas Whyte waved farewell to the most successful riding career in Hong Kong history yesterday at Sha Tin, saluting his fans long after the last race had weighed in. The 13-time champion jockey’s final ride did not produce the fairytale victory that he and the Sha Tin faithful desired, but the day delivered heart-warming displays of respect and appreciation for a sportsman whose achievements have lifted him high into the pantheon of racing’s legends. Whyte retires with a Hong Kong career total of 1,813 wins – 894 more than current champion Zac Purton. His mounts earned total stakes of HK$1,587,210,086.67 (NZ$300 million), multiple Group One triumphs and, of course, his defining 13 consecutive premierships from 2001 to 2013. His win strike rate over more than 22 years riding at Happy Valley and Sha Tin stands forever at 14.78 per cent. Whyte’s blank on his final day was not for the want of trying, but did owe something to a stroke of misfortune. Two seconds were his closest placings – Mr Croissant in race two and Seven Heavens in the eighth – but the near-miss came when he rallied the impeded Storm Signal close home in the seventh contest, only to take third. “I would have won the race,” he said. “That’s the only bittersweet ending to the day. I’d have loved to have had a winner, but I’m happy with the way every horse ran and the way I rode every horse. “I’m leaving on a high, but I would have won on Storm Signal. I was just gaining momentum, I was coming to win the race and when you get knocked sideways like that – then the horse on my inside turned my hindquarters and he lost momentum and still picked up. – Story and photo: Hong Kong Jockey Club.